It’s hard to believe that there was a time when being compared to Amy Winehouse could be considered complimentary, but NOW meant it in the best possible way when they compared this week’s cover girl, Toronto soul singer Zaki Ibrahim to the troubled British diva. Even so, I don’t necessarily hear it – where Winehouse trades in deliberately modern-retro soul, Ibrahim has got more of a contemporarily urban R&B, hip-hop thing going on. But if Winehouse-scale success is in the cards – preferably without the substance abuse problems or terrible dye jobs – I’m sure she’ll take the comparisons. Ibrahim is playing the Mod Club this Tuesday night, January 29, and courtesy of REMG I’ve got two pairs of passes to give away to the show. 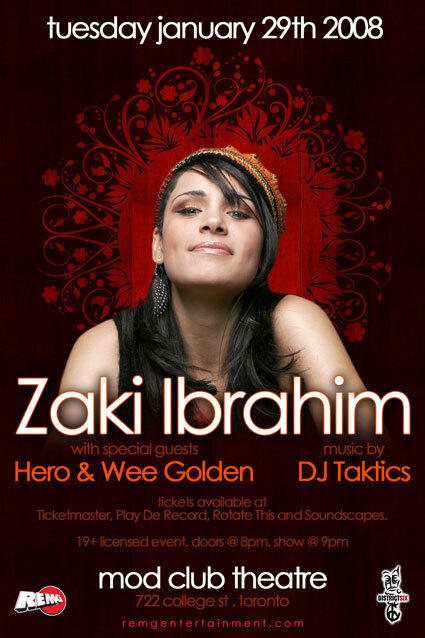 To enter, send me an email at contests AT chromewaves.net with “I want to see Zaki Ibrahim” in the subject line and your full name in the body and do it before 5PM tomorrow, Monday 28. Grok the poster for the show here. Here are some things you might be interested in knowing about me. I do not smoke and I don’t drink. I enjoy life, going to movies, traveling, and enjoy spending time with family and friends.
. I would love to meet people and hopefully meet someone woman who will be right for me.